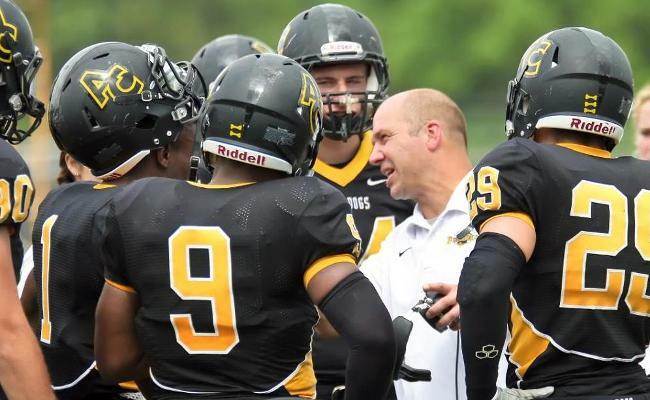 In his eighth season as the head football coach of the Adrian College Bulldogs, Jim Deere has established a tradition of winning at the school that extends beyond the football field, preparing his players to thrive and succeed in life as well. Lemony Snicket once said, “Just because something is traditional is no reason to do it, of course.” There has clearly becoming a negative connotation related with traditions. The traditions of the past are often looked upon as antiquated ideas that are standing in the way of progress and, thus, concepts and philosophies that should be done away with. Fortunately, the sports world does not see it this way. When a team has reached a level of greatness in their history, there is a call to continue in those traditions. Teams such as the New York Yankees, Montréal Canadiens, Michigan Wolverines, Green Bay Packers, and Alabama Crimson Tide have created a culture steeped in tradition, which has made these organizations some of the most revered and respected in the history of sports. When there is a tradition, a culture of success, it can be a very powerful tool in helping to continue that success. Many football players dream of a day where they would take a snap under center at Packers Stadium, thinking of how incredible it would be to be playing on the same field where greats such as Bart Starr, Brett Favre, and now Aaron Rodgers have commanded Super Bowl winning teams. The tradition of excellence draws players to the team as they long to be a part of that winning culture. To maintain that kind of winning tradition, sometimes an organization must return to its roots, to reach back to its past and bring in someone who truly understands the ways that are necessary to create a winner. This is what Adrian College did when they hired former standout player Jim Deere as their 24th head coach, knowing that he had the character, wisdom, and ability to return the Bulldogs to a tradition of football success. Jim Deere was no stranger to Adrian College when he became its head coach in 2010. He had attended the college, and was a four year letter winner with the Bulldogs from 1985 through 1989. In making his choice to come to the school, the Coach is finding that many of the things he is telling recruits now about why they should want to come to the college were reasons why he wanted to come to Adrian himself. During his time at the school, he helped lead the team to the 1988 Michigan Intercollegiate Athletic Association (MIAA) title and a trip to the national playoffs, only the second time in the school’s history that they had made it into the postseason. 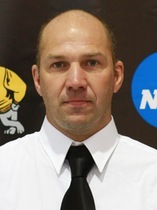 After graduating from Adrian College, Jim Deere remained on as a graduate assistant. He coached the linebackers until moving onto coach at Sterling Heights Stevenson High School and later at Morenci from 1993 to 1996. Coach Deere returned to coach for the Bulldogs for the next 14 seasons, becoming the defensive coordinator in 2007. The Bulldogs defense had a great deal of success under his tutelage, including helping the team to lead the MIAA in five different defensive categories in 2009. The Bulldogs were having success on the field, but had not won a share of the conference title since 1997. After the team finished 6-4 in the 2009, long time head coach Jim Lydall was let go and Jim Deere was named as the new head coach. This was a dream come true for the Coach. While excited about the opportunity to be the head coach at his alma mater, Coach Deere made it clear that he was not taking the position for nostalgia’s sake. He intended to win. “I’m here to win a championship and I understand that if I don’t do that, my time here might be short,” he explained at the time of his hiring. In his eighth season as the head coach of the Adrian College football team, Jim Deere has turned the Bulldogs into one of the powerhouse teams of the MIAA. After finishing 5-5 their first season, including 4-2 in the conference, Adrian went 8-2 the following season. In 2012, the Bulldogs won their first outright conference title since 1983 when they went 9-1, including going 6-0 in the conference. They entered the playoffs for the third time in school history, but this was a small taste of what was to come. After going 6-4 in 2013, Adrian finished 8-2 in the regular season in 2014 and won their second conference title in three seasons, going 5-1 in the MIAA. They would fall in the first round again, but had accomplished something that no team at the school had ever done before – going to the national playoffs twice under the same head coach. In eight seasons, Coach Deere has led the team to a 49-27 record. His next victory will be the 50th with the Bulldogs, the quickest to reach that mark in school history. While success on the football field is why men and women get into coaching, the truth is that the development of young men is why most get into the profession. At the Division-III level, few players are going to advance to the professional ranks, so development of players into young men ready to enter the world and overcome the challenges they face is the most fundamental lesson that any coach can provide. It is what drives Jim Deere. This is a fast food world that we live in, where results are expected now and they are expected with perfection. That is a lot of pressure for a 21, 22 year old to cope with, and is one of the areas that Coach Deere has focused on in the development of his players. 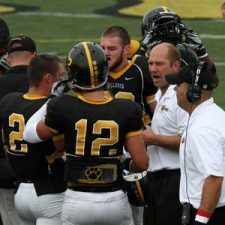 There has been a lot of success on the football field during the time that Jim Deere has been the head football coach at Adrian College. There have been 69 players named all-conference honorees, with 30 being named to the first team. Several have been named to the academic all-conference team and there have been players that have earned national academic honors as well. While the play on the field and the performance in the classroom have been important, what has meant the most to Jim Deere is the culture of service that surrounds the team. He wants his players to see themselves as more than students or players, but as members of a community that need to serve one another. That lesson starts with himself and his coaches. A coach’s duties are numerous and can be time consuming. Many spend the night in the office at least a couple of nights a week, and so player interactions away from the field can become few and far between because of all the administrative functions and preparations that has to occur. However, Coach Deere loves those opportunities, recognizing that it gives him the chance to help these young men make greater sense of the world. With 100 plus players on a team, it is hard for the coaching staff to be able to attend to the needs of every player. There simply isn’t enough time to do so, and this is why service is just as much a part of being a senior at Adrian as it being a student. It wasn’t long ago that Albion and Hope were the big dogs in the MIAA, but Adrian has made themselves one of the most competitive teams in the conference, thanks to the dedication to the traditions that made the Bulldogs a great team when Jim Deere was a player. While that is of satisfaction to the Coach, the truth is that he knows that his players are heading out the door to a world that does not care about their traditions. To prepare them for that world is always his primary focus above and beyond wins and losses. Responsible, respectful young men. There is no doubt that if they follow the lead of their head coach that this is exactly the kind of young men that they will be. Coach Deere has not only helped to create a winning tradition at Adrian, but he has helped to develop players that are molded in his own image. In a world begging for someone to bring new ideas that will help to change a plethora of problems, maybe it is time for the us all to start looking at those who have been taught in the traditions of greatness for solutions that work. As Carlos Fuentes once said, “There is no creation without tradition; the ‘new’ is an inflection on a preceding form; novelty is always a variation on the past.” Jim Deere is proof that when you build off of traditions, you can truly create something destined to succeed.